If you're interested in a job as a food service specialist in the Marines, rest assured you'll be doing more than peeling potatoes. It is an important job in the armed services: Marines (and soldiers, sailors, and airmen) won't get very far without being properly fed. 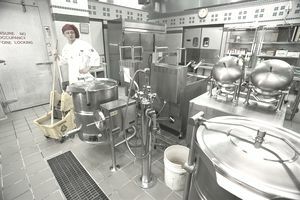 Food service specialists, which are military occupational specialty (MOS) 3381, are involved in every aspect of food preparation from procurement to storage and distribution, in both garrison and field environments. Their duties extend to funding, requisitioning, purchasing, receiving, accounting, and storing food supplies, along with of course cooking, baking, and serving. Marine food service specialists could potentially be stationed anywhere the Marine Corps has a need. All Marines need to eat, so wherever there are Marines deployed, a food service specialist could possibly be sent there as well. Since they're likely to spend time in the field, an important part of the food service specialist job is quality control and assurance, making sure the food is kept in sanitary and safe conditions. Like a sous chef at a restaurant or a line cook at a diner, the day-to-day responsibilities of this job include preparing fruits and vegetables, meat, fish, and poultry as well as baked goods. While there's likely to be a potato or two in the mix, clearly this is a job for someone who knows their way around a kitchen. The food service specialist also keeps track of supply levels, making sure there is enough food on hand, and for conducting quality assurance evaluations. The most senior grades of food service specialists act as administrative assistants to the food service officer or food service operations officer. To qualify for this job, a Marine needs a general technical (GT) score of 90 or higher on the Armed Services Vocational Aptitude Battery (ASVAB) test. They'll need to complete the basic food services course, or complete a minimum of six months of on-the-job training as a food service specialist. All courses are taught at U.S. Army Quartermaster School in Fort Lee, Virginia. Food service specialists work closely with food service officers (MOS 3302) but have different responsibilities. Food service officers are tasked with overseeing the organization and planning end of the Marine Corps kitchen operations, which includes budgeting and coordinating the food service and subsistence program as well as all the logistics involved. Anyone who aspires to the food service officer job must first serve as a food service specialist or as a Marine aide (MOS 3372). The job of Marine aide functions as a personal assistant to general and flag officers, helping with small tasks and other details.